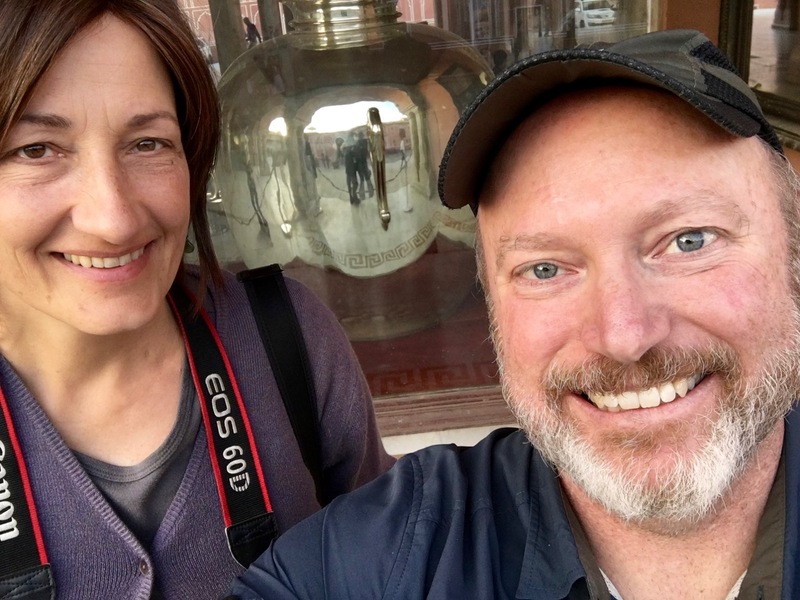 On December 14, Beth and I visited what’s called the City Palace in Jaipur. She had already walked by there earlier, on her way to find a place to watch birds. 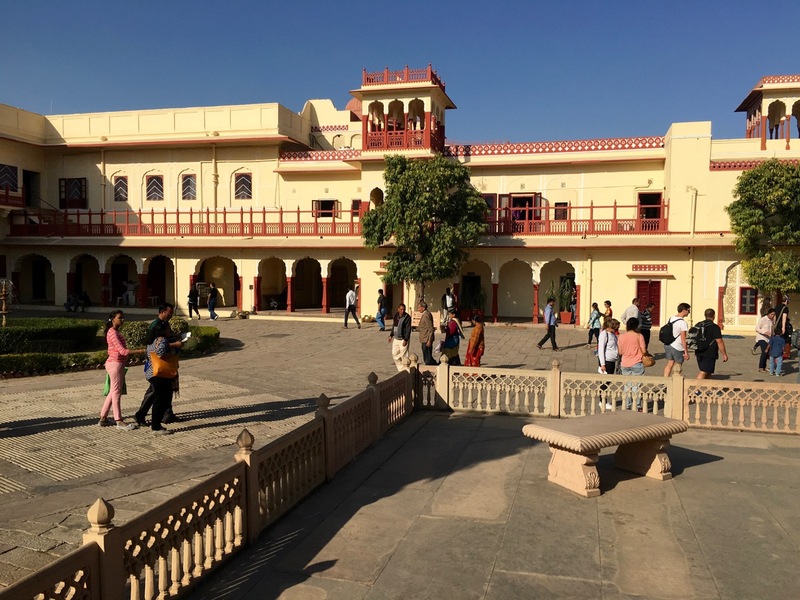 City Palace is one of the top three tourist spots in Jaipur, so we figured we should go. This one was within walking distance of our hotel, which was pretty unusual. And we decided to keep it low-key by not hiring a guide. Wow, tourists walking instead of taking a tuk-tuk? We were the talk of the town for our strange ways, I’m sure. This post talks a little about what we saw that day, with a few photos. Read on to learn how I insulted the royal family’s guard, also. Note: If you’ve been reading both my Facebook posts and this blog, you may be confused. Didn’t Todd and Beth already leave Jaipur like two or three weeks ago? Yes we did. Sorry if it’s weird, but I’m way behind on my blog, but trying to catch up. In fact, as I write this we’ve already left India and are in Thailand. Also, I’m writing these blog posts slightly out of order sometimes. But I’m dating them in the order of when the actual thing happened, not when I wrote about it. So if you’re reading this months or years later, it’s all in chronological order. Nowadays Jaipur is the capital of the Indian state of Rajasthan. 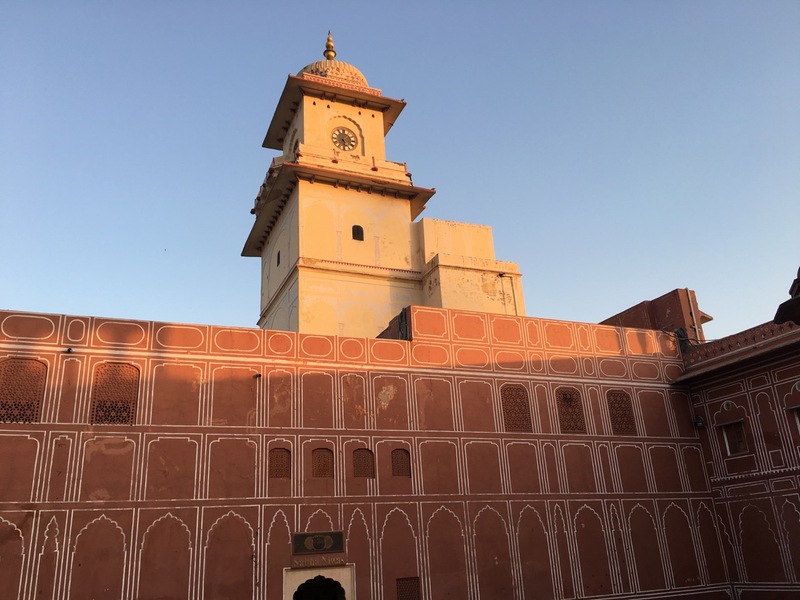 Before the capital was moved here, it was Amer (more on that in my post Jaipur, Part 3). 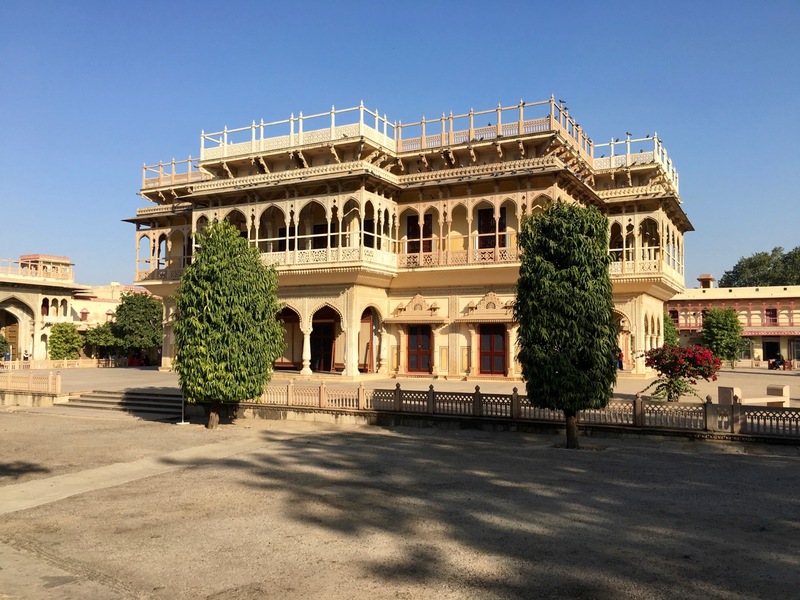 What’s commonly called City Palace in Jaipur is a collection of buildings, some still used as the residence for the royal family of the Maharaja of Rajasthan, some converted from palace buildings to museums, and some just sitting there as historical sites to show how things were when the king was in power. Mubarak Mahal combines architecture styles from three influences. Can you tell what they are? 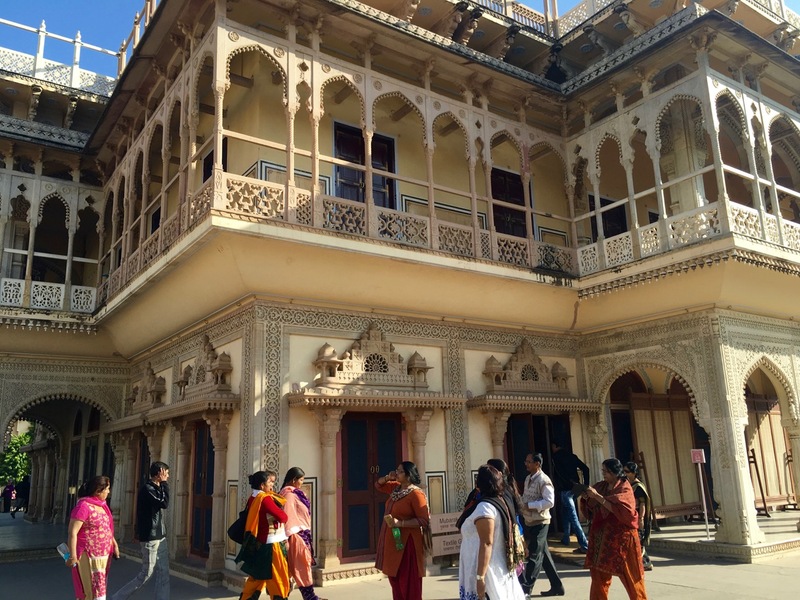 The first place we visited was a building called the Mubarak Mahal, meaning “auspicious palace”. It was built relatively recently, in the late 1800s. Nowadays it is a museum containing a bunch of clothes and other possessions of the past kings. It’s in the middle of a great courtyard area that’s painted pink. Jaipur is known as the “pink city” because the natural sandstone around the city and used for many buildings within the city is pink, and also because a lot of painted buildings are also pink. It’s so pink! This clock tower has some significance I can’t remember. Here’s a massive door I thought was amusing. Inset is a much smaller door. 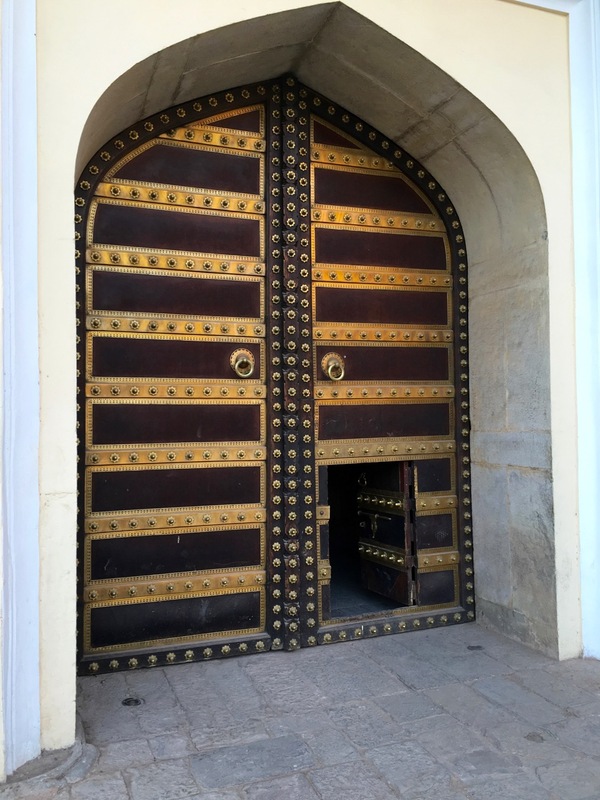 I have no idea what the deal is here, but my guess is maybe they only open the big door when the king wants to go in or out, and the day-to-day passage of servants is done through the small door. You can’t really tell from the scale, but the top of this doorway is just about as high as my belly button. 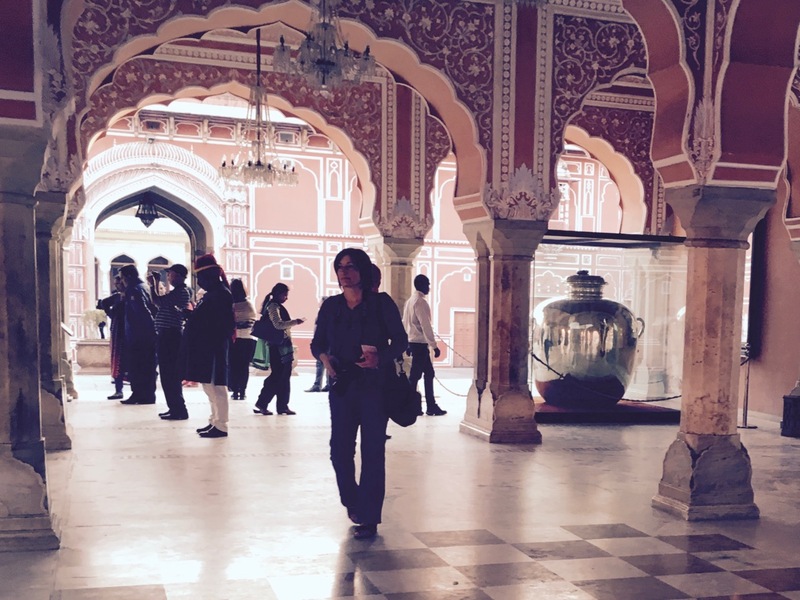 Another area of the City Palace is the Diwan-i-Khas, which was the private audience hall for the maharaja. Today it’s where these two giant silver urns are displayed. The urns are in the Guinness Book of World Records as being the largest items made from silver. Millions of silver coins from Rajasthan were melted down so the maharaja could have these and a third just like them. You see, he was going to sail to England to meet with the king. But he didn’t want to drink the English water. So his entourage took these three giant urns full of water from the Ganges, so he could have holy water to drink for the entire journey. Each urn weighs 340 kg (empty) and holds 4000 liters of water. Doing a little simple math (thanks to the metric system), I know that 4000 liters of water weighs 4000 kg. So when they were full, the three urns weighed a total of 3 x (340 + 4000) = 13,020 kg. So yeah, 13 tons of water and water urns went with the king. It’s good to be the king. One of the things I liked most about this trip was visiting the art gallery, which had a temporary exhibit that included a lot of portraits of members of the royal family through the years. But best of all was a section of photos of and/or by one of the modern kings who took up photography as a hobby. He was Maharaja Sawai Ram Singh II, born in 1834. And his photos were amazingly good. This was back in the day that getting any exposure to come out was nearly a miracle, but he also had a great artistic understanding of composition and light, and practiced on himself. So we have lots of photos of him doing “modern” stuff like reading books which wearing his round John Lennon spectacles, playing cricket, etc. I don’t have any photos to share, because we weren’t allowed to take pictures of anything inside the art gallery. But I wanted to at least mention it. I’ll leave you with this photo by Beth. It’s me, standing next to the royal family guards. Remember, the City Palace isn’t just a tourist attraction. 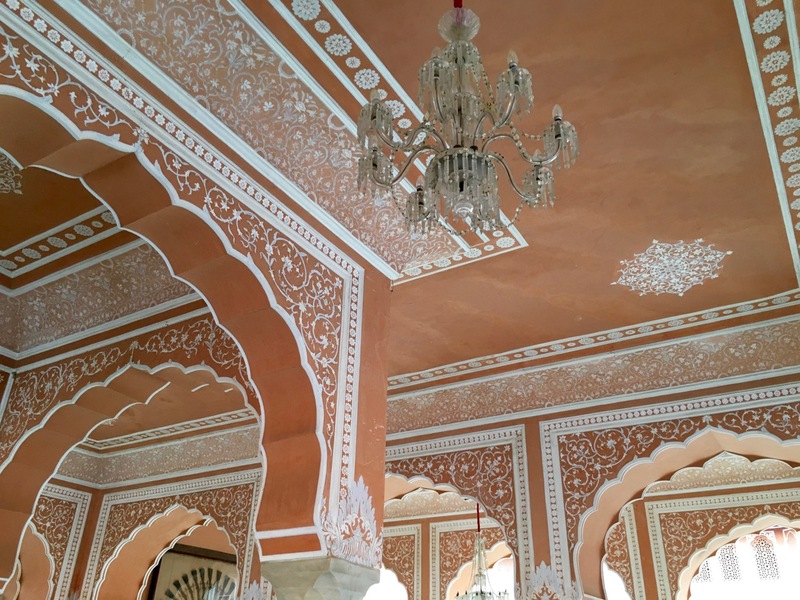 Part of it is still used as a residence for the remaining royal family of Rajasthan. So occasionally a very clean black Range Rover will speed into the courtyard and these guys will throw open the doors for the princess to come through. Then they close the doors back again, and wait around for hours until she wants to leave again. Meanwhile, they take photos with tourists. Hey, might as well, I guess. If I had to dress up in this fancy guard uniform every day just to open this one door once or twice, I’d want to interact with all the folks visiting from faraway lands, too. As you might imagine, the guards expect a little gratuity for taking a photo with them. I should’ve seen that coming, but didn’t at first. So one of them who was not in the photo with me pointed out to me in English, “It is customary to leave a tip for the guard. How often do you get to meet a guard of the royal family?” There were two guards, and I pulled out a small bill and handed it to one of them, thinking he would split it with the other one. The body language said, “No way, José.” So I awkwardly fished out another small bill for the other guard. I think they were both expecting two or three times as much of a tip from me. And so that’s how I insulted the Rajasthan royal palace guards! Good times.